After your loved one finds recovery, it's normal to be excited. However, according to the National Institute on Drug Abuse, 30 to 40 percent of drug addicts tend to relapse from their plan of treatment. If this happens to someone you care about, it's also normal to feel disappointed. While all of our reactions and situations may be different, it's important to have a toolkit in place so you know how to handle a relapse in a way that is both healthy for your own mental health, and supportive of your loved one's ultimate recovery journey. For many people, relapse is a part of their recovery journey. Here are a few things to remember in order to be there for your loved one. 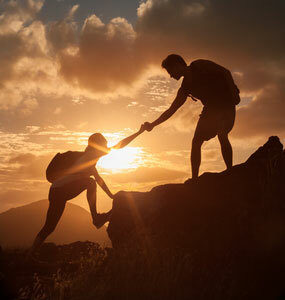 Here are four things to remember as you help support your loved one through a relapse. Being supportive during a relapse might not mean what you think. A relapse is not a positive thing, but it can be a learning experience with the right mindset. So while you shouldn't condone the act of using, re-channel the event to encourage and support your loved one to stick with recovery. Your loved one might feel fed up or guilty, so your continued support of their overall recovery journey will help. Encourage them not to look at recovery as an "all or nothing" approach—remind them there will be easier days and harder days. What's important is that they stay committed to the process. Remind them of the healthy changes you've seen in their life and that a relapse doesn't have to mean a long-term return to using. You aren’t responsible for how they respond to this information, but supporting them in the way of recovery might give them another reason to stick with it. As a support person, you have a right to be honest, upset or disappointed. Your feelings and concerns might vary depending on the situation or your loved one's history with addiction, but it's important to be honest. You might have an easier time expressing your concerns in a counseling session or with a third party who is safe and neutral. No matter how you choose to express yourself, it's important to remember that emotions are okay – and it's okay that you have them. As your loved one works to come back from a relapse, modeling healthy behavior, emotion and honesty will help set an example. No matter what happens, you won't be carrying the weight of the relapse on your shoulders, and instead, you'll be living transparently and honestly to the best of your ability. 3. Keep your own boundaries. Being supportive of your loved one doesn't mean you need to ignore or normalize a relapse. As you show support and honesty towards your loved one, consider if it's time to put up boundaries. Whether this means distancing yourself for a period of time or avoiding certain conversations, topics or situations with your loved one, you're free to make the decisions you need to make to stay healthy and resilient. As you consider boundary setting, consider working with a counselor or therapist to help you. While we all have emotions, it can be difficult not to let those emotions into all of our conversations. A third party can help you stick to the facts—with love and compassion. Your loved one shouldn't have to deal with a relapse on their own—and neither should you. If your loved one has relapsed, having a list of resources on hand could be beneficial. Your list might include treatment centers, counselors or AA/NA groups. Being supportive doesn't mean you have to navigate the waters of recovery for your loved one – empower them with the information, but give them the next step of action. And just as you're equipping your loved one with resources, have resources of your own, too. Whether this is Al-anon, a self-care day or a family support group, having help during your loved ones' relapse can help you process the situation and not let it consume you. For many people, relapse is a part of the larger journey of recovery, so stay optimistic and hopeful for your loved one. This could be an important experience that helps your loved one get sober for good. But remember, your loved ones' next steps are up to them, not you. By having these resources in your back pocket, you can be supportive of your loved one in a way that expresses your love and concern, while being honest and wise towards your own mental health. If you or someone you know is seeking help from addiction, please visit our directory of treatment centers or call 800-891-8171 to speak to a treatment specialist.